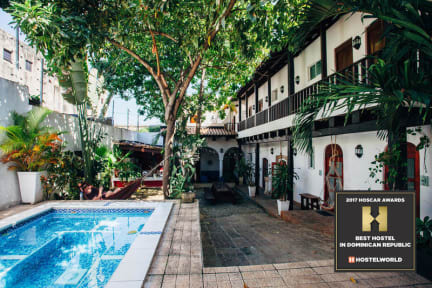 Island Life Hostel is located in the 'Zona Colonial” the oldest European settlement in the New World. Located just steps away from historical sites, lively bars, great shopping, and amazing food. Our hostel is in a newly renovated historic colonial building with a variety of dormitory and private rooms to suit every travellers needs. Together with a full bar, and freshly prepared daily menu options this helps provide a great backpackers’ experience. Our knowledgeable staff can provide a wealth of information about local and national attractions and transport links, so you can get the best out of this beautiful island. - PASSPORT required for each guest at check in. No copies or other forms of identification are accepted. -Full payment is required in Dominican Pesos or USD upon check in for your entire stay. - No refunds will be given for early departures. -If you are arriving after midnight it is essential that you inform our reception before your arrival date so that we do not cancel your booking. -No Shows will be charged the full amount of the reservation. - In the event you need to cancel, you must let us know no later than 72 hours in advance of arrival. If you cancel less than 72 hours before your stay we will charge the full amount of the reservation. - No guests from outside the hostel are allowed entry. - The management reserves the right to cancel the remainder of any booking with no refund if guests are found to be breaking house rules. - We have two friendly dogs on site. Indeed, one of the best places I've ever stayed. Will be back! Great hostel. Staff was friendly and helpful and drinks were good. Bathrooms were clean and beds were comfortable. Vibes were good and social atmosphere good for going out. Free breakfast was sufficient and the location was great for the history and nightlife. Loved the dogs and I admire the collection drive the hostel has to help rescue strays in need of veterinary care in the city. Love this place! Ella is very sweet and such a welcoming person! 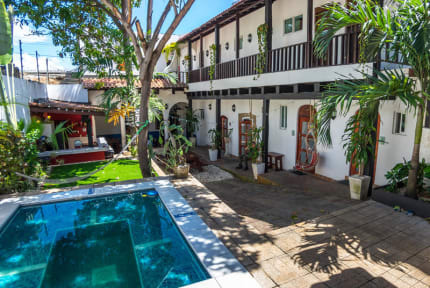 The place is in the downtown, perfect for exploring Zona Colonial. Rooms are comfortable and the garden is a nice place to hang out! Great location! It is a short walk to all the Zona Colonial sights. The staff were VERY helpful, friendly and fun. Felt like it was a safe area and they always kept the door locked. I had a vehicle, so they recommended a secure car park with in walking distance. The bathrooms were awesome and the rooms were pretty solid with fans/lights on each bed post. Plus, the breakfast was AMAZING. Dinner looked excellent as well but I opted for street food. Great value for the money and highly recommend! Pros: Staff was amazing. In particular Viktor, Amber, and Erik were very kind throughout my entire stay. The bathrooms and rooms(especially the rooms) were clean. Tour arranged through hostel was great(thank you Chris). Cons: Bar area when entering hostel and first floor common area in courtyard could be kept cleaner. Only mentioning for honest feedback because if this were not so, I would have rated the hostel a 10/10. This can be overlooked as hostel clean otherwise. Great stay! Met a lot of awesome people, and the breakfast was good. My only feedback is that the Wifi isn't very good inside the rooms. This makes it hard to check messages at night before bed (NBD, just something to consider). Also, I booked two tours through the hostel, from the binder sitting in the bar/lobby. Solid trips but not friendly for those who don't speak Spanish. I can understand and speak well enough, but others couldn't understand anything. The guides didn't speak any English! Clean facility, great private rooms. The communal shower is one of the cleanest ones I've seen at a hostel. The downstair area is also kept very clean. Two very friendly dogs, and a cat! It isn't a big hostel but enough people to get to know other travelers. The 7PM welcome shot is a really good way to meet others if you're alone! The people there are so nice, both tge personal and tge guests. Always a good vibe and if you're looking for some good and fun times it's the place. It ia in thw center of the city and the doorms are pointing out towards the streets, where the are some traffic and noise during the night. I enjoyed the vibe and decor of the place as well as the location. I did not feel much hospitality from the staff the day that I arrived. I emailed the owner asking for a room far away from the common area and we ended up being right next to the common area upstairs. I was awoken by the loudness from the other guests around 3 AM. The bathrooms were cleaned by the nice local every morning but were disgusting by the evening along with the other areas upstairs. I would not return to this hostel.